He's one of the most popular and bankable actors in Hollywood. Tom Hanks has been wowing moviegoers for more than three decades and pulled in over three billion dollars around his films. He's had starring roles in award winning films like Saving Private Ryan, Big, and Castaway. Hanks has also won the Oscar for roles in films like Forrest Gump and Philadelphia. Today, he is out with a new film called Larry Crowne that he produced, directed and stars in. Please leave your questions for Tom Hanks below and be sure to tell us where you're writing from. Was Bachelor Party the best movie ever in your opinion? Did that experience contribute to making you the man you are today? Hi Tom–I just wonder if you would like to work with your son, Colin, in a movie someday? As an Aston Villa fan i would like to know, have you ever or do you intend to go to a match? Fabulous career and movies matey. What drives your energy? Is it the ambition of reaching the next peak? Gradually fewer peaks of opportunity arise. So how do you target your next challenge? Does the curve of age and mortality (in the entertainment world) v energy conflict ever arise in your mind? Keep going for it buddy......you are one of my heroes. In Japan you're a massive hit and have been for decades here, with my Japanese wife as well (you may or may not know millions of Japanese women adore you). Will you ever do a picture in Japan? PS: Castaway is still my all time favorite. Stallone is to Schwarzenegger as Hanks is to??? Will a Forrest Gump sequel ever be made? As a fellow thespian and fan, I love your work. My one question is where did you study and what type of acting style (i.e. stanislavski, method, etc...) do you use the most? Tom, this Canadian wants to thank you for assisting disabled actors in Toronto. I read about how you helped them a few years ago, and that story always stuck with me. I'm sure you like to keep your humanitarian / philanthropic interests out of the media, but I wondered if you might share any other causes that you are passionate about with us? Specifically, I share your interests in history and space exploration, and thought perhaps you might have some interesting personal projects happening in those fields? Thanks! I've been a huge fan of your movies for the last 30 years or so. Which one of all the movies you acted in is your favorite? In the sense of, in which one did you do your best acting, in your own opinion? What has been your favorite role in your career? I am writing from India, and want to tell you how much we love you here. I want to ask you – What makes a film good? What makes a person good? I would be very happy if you answer. Which comedy late night host do you like or prefer going to promote your stuff? How do you prepare yourself for a role to allow yourself to shed your own identity and really become the character you're playing (you seem to do this much better than a lot of actors–we forget that we're watching Tom Hanks and really think we're watching Forrest Gump or Carl Hanratty)? By the way, one of my favorite characters you've played was Prof. Dorr from the Ladykillers–everytime we eat waffles, I think of you saying "We must have Waffles!" For a while there you were doing some pretty decent movies, then what happened..? As you think back to the early 80's when your film career was just starting, how has the film industry changed over the past few decades? And has it influenced the path that has lead you where you are today? Im 18 and I am your biggest fan, lol , i guess. And I wanna ask "WHICH ERA OF YOUR LIFE, YOU MISS THE MOST "? Tom, Who is one person who inspire(d) you the most? Hey Tom, I have loved all your movies. I would like to know the inspiration and motivation in your life and what would you cite as the reason for your enormous success in your career. I have been watching your movies all through my adult life and the two movies I liked you in the most were, Apollo 13 and Saving Private Ryan. But I still laugh when I think of the movie Dragnet, Especially the part when you and Dan Ackroyd did the "Pagan Dance" in front of Harry Morgan. I recently saw your wife in a Law and Order SVU and she was brilliant in it as a guest star. There is one actor that I like with whom you worked with twice, Barry Pepper. He was excellent in his role as Bobby Kennedy in the Kennedys miniseries. Many thanks for all your hard work over the years and I hope your new movie Larry Crowne is a success. What do you like to do between movies ? Mr. Hanks: please produce a film about the 8th Air Force over Europe during WWII. I think it is time (with CGI being what it is) to show what our airmen went through with realism. I was one of the persons who suited you up for the Polar Express movie. I put those little white reflective markers on you. Just wanted to say thank you for being an awesome and nice guy on set. Hello Tom, i'm chenshi from shanghai, china. Did you ever lose yourself in the rolls you play? What i mean is that some of the characters you portray are mentally unstable. Did you ever find yourself in a corner off screen speaking to a soccer ball during the shootings of any of your films? I would probably fall into a crazed revery myself. In the movie saving private Ryan, at the last scene, when you asked private Ryan to "Earn this" what exactly do you mean...in my opinion, no man can ever earn that. Thanks, Tom, for being such a good guy – not to mention great actor. I'm going to have to go with Toy Story as a favorite 🙂 and FYI – I feel like I can call you Tom, rather than Mr. Hanks, because that's just the type of guy you come across as being 🙂 I wish for you a happy, healthy and fulfilling life. Thanks for the blessings. Any secret children out there? Kidding! What enquiring minds would like to know, given the recent (and not so recent) dissection of marriage, would you be so kind as to share what works for your marriage and how you two manage to stay together? Take away being in the entertainment buisness, you would still have the marriage years to impress. The first movie I ever saw starring you when I was just a kid was 'Big' and I have been a fan ever since. Your acting in 'Forest Gump' was amazing and the movie still holds the number 1 spot for me since its release. Question: Who is your favourite actor? What's the hardest part about roller-blading? Just a follow up note, I attended the Directors Talk at the LA Film Festival on Sunday and found that being being behind the lens can offer a different experience-What do you prefer? Actor or Director? I enjoy your works so far... one more question:how do you select your support team during your film shoot? If you need a PA during your next production it would be an honor to help you facilitate your vision on film. TOM HANKS – thank you just for being yourself. I loved all your movies. I'm 63 y.o. but still dream I'll meet you someday in this life. Please, don't stop doing romantic films like the ones you did with Meg Ryan. This disturbed world will always need nice, real and sweet stories. I remember noticing that "Sleepless in Seattle" didn't have a single kiss! Yet it's one of my favorites. Love your wife, too. I think you (couple) make a great example. You are by far my favorite actor out there....there's not a Tom Hanks film I don't enjoy! Which film do you feel has had the most significant impact on society? And which film is, for you personally, the most significant in your own life? Hi big boss, i thank you for your hard work and some of the things i learn from your movies. i watched the davici code, angles and demons so when are we to see the third and what will be the title of that movie. You have been a big hero of mine since i saw Forrest Gump as a child. It is, by far, my favorite movie of yours, next to The Da Vinci Code, The Road to Perdition and The Toy Storys. I was wondering what attracted you to these unique roles? Was it the characters, the story line? Thank you for all the movies youve made over the years, your a true inspiration. What artist do you find yourself listening to most? Over here in Belgium, you're a huge hit! What sparked your love for making films? Was there ever a time before you became famous and started making films that you ever imagined you'd be living the life as a huge Hollywood star and a huge inspiration to millions of people around the world? Would you please allow me to play with you on any other new movie, you would be working on ? I have been watching you ever since Boosom Buddies!!! OMG laugh out loud funny!! Your very talented and I just love your work. I am very pleased to know that you and your family are doing well and many congrats to you for a plethra of good works!! May you have many more years of continued success!!!! If you could have a "re-do" of a film that you made which would it be and why? Mr Hanks, If you (not the director's, producers, or film companies...YOU) could re-make any movie, and not worry about the cost or possible financial sucess of it... just do it for the sake of acting that role. Which one would it be? Thank you for what you have done to promote the history of the space program to younger generations. As a teen, I was a witness to the Apollo program, following it from abroad on TV and the news. The space program inspired me to study computer science and played a major role in my decision to come to work and live in the US. Thanks to movies and documentaries, like the ones you helped produce, I can show younger people what it was like to go to the moon, and back, in the now distant 1969-1972 years. Hey Tom I've been a fan since I was a child and always will be. After all the people you've met and worked with throughout your career, do you still find yourself starstruck at moments? Also, while watching The Pixar Story I was amazed to hear that you and Tim Allen had no idea what the movie was going to look like until it was almost completed. How did they ever talk you into joining the cast? What is your favorite movie/ project that you've worked on? You've Got Mail is still one of my all time favorite movies! I always love to watch it with my mom and bond!!! You have managed through the years to keep your personal life away from the spotlight of the media, and your marriage is an example to your colleagues and the public in general. What's your secret? My son is currently serving as a medic with the 101st Airborne, 2-506, 4th Brigade, Easy Company in Afghanistan. This is the exact company that is chronicled in "The Band of Brothers" which you produced. My question is, has there been any thought about doing a current day "Band of Brothers?" My wife and I have enjoyed all your films seen thus far. One thing we often think about (and this includes our thoughts in respect of other well known actors as well), is : "how much of the real Tom Hanks is in the part being played on the screen." The fact that some actors often play similar characters/roles in diffent movies increases our friendly suspicion that actors of even the highest quality like yourself and, for example, Kate Winslet, Colin Firth or Nicolas Cage must by their very different natures reflect at least a part of their real selves in each new movie, however much the script/director/producer calls for them to portray roles alien to their true selves as seen by your close friends in every day life off the set. Kind regards, Hentie and Cora, South Africa. Unlike many actors and actresses today, you've managed to keep the media at a respectful distance from your personal life. What advice would you give to a young actor to prevent media intrusions into their personal life? Is it as simple as just behaving yourself? I would like to know more about what social issue are you passionate about – and if you've done any work/brought attention to that area? Genuinely curious. I became your devoted fan when I saw the movie "Sleepless in Seattle". Do you have any plan to shoot yr movie in China in future? Would you do a movie based on story of Mr. John Leighton Stuart? Your partnership with Steven Spielberg has produced some of the most affecting, groundbreaking war drama of the last two decades (Saving Private Ryan, Band Of Brothers, The Pacific). Will you be working with Steven again on any similar projects in the future? Thanks for your work on Big Love, so many people have their lives ruined by the inequality within certain cults.I can see how your approach may help minds to open. The general public need to know what is going on in that sub culture. I have a great idea for a movie based on true events from the viewpoint of a woman who was almost forced into polygamy by two main cult leaders but bravely stood up to them and dared to speak out in the 1830-40's. Happy to pass it on to you if you want to bring the story to the masses. My late Mother was impressed with you and your teams civility towards the residents of Ellen Brook Lane when you let them visit the French Village set of Saving Private Ryan for a tour and Champagne at Hatfield air field as recompense for filming the bombing scenes at night. SPR – One of the best films of the 19th C. -An honour that you chose Hatfield to film some of the most poignant scenes. How has directing and producing changed your approach to acting and choice of projects? Would you consider making a movie based on the book "Until Tuesday" by Fmr. Capt. Luis Carlos Montalvan. It was a wonderful read, addresses the issues of PTSD affecting a lot of our military personnel who are fighting in the Iraq/Afganistan. Tuesday is his service dog who is trained for PTSD & the social issues involved with having a service dog in todays society. As you know, only one percent of our country voluntarily serve in the armed forces. My son is a 17 yr veteran & has served in the Middle East. I've worried that he may be affected by the intensity of these wars. I attended a luncheon at the Boise Civil Club in April 2011 where Adm. Mike Mullen was the guest speaker. Deborah Mullen, the admiral's wife, spoke on the subject of PTSD affecting the spouses & children of our deployed military personnel. Thank you for all the years of wonderful work in the movies, Rita included. Unfortunately, with corporations consuming the movie industry, quality work is rarely seen anymore unless it is an independent. Thank you for allowing me to send this commentary. I have friends and Friends. The first being people I hang out with, work with etc., the second people who will actually be there when I'm down and out into the gutter. In my case only my wife qualifies as a true friend I can always count on nomatter what. They say 'it's lonely at the top', do you have any friends left from back when that are not Hollywood related..?..people who would be there for you if you crash and burn right now...? I've been a fan of yours for years, even though I'm still a kid. I've seen many of your movies and love them. So I wanted to ask, if you could be any of characters from any movie you've been in, which one would you be? I know you started film quite early but what were you before you became an actor ? Do you still enjoy doing movies and will ever produce or direct your own ? wont say im ur greatest fan but i love what you do! specially catch me if u can, green mile, forest grump and soo on!! ooh! forgot da vinci code too!! looking out for the new one you just did!! –	How will you Improve Equal Acting Higher Education and Job Opportunities in the USA and beyond? –	How will you Improve the USA border protection against Drugs trafficking so that No Drugs comes into Hollywood, especially No drugs for Lindsay Lohan and Amy Winehouse? I am awaiting Tom Hanks’ replies. I must tell you that Forrest Gump has made me part of who I am today, I feel in some sense. You have also inspired Dean Karnazes, who has challenged me. Altogether, I wish you the best in life and Just Run! Tom, when will you host the Oscars? I mean, we don't even care if you wait to get asked! Just crash the party & take over the whole gig! Looking back over your film career, is there any of them that stand out where you have said to yourself "I really could have done that one better", and if so why? In one sentence, how would you like to be remembered as a person in 50 years? The movie business is going through a hard time.Not much work for everyone anymore.I noticed you made this movie..is that due in fact ot the lack of work around. DO you think people should know,for those younger ones, entering the business ,that,yes,live your dreams...but the film business does not offer what it used to these days,that it used to..and the chances of getting to the top are remote ,( unless you already there through famaily and /or contacts etc) these days,as even many of the top people arent getting work and arent getting paid..Do you not think its our resposnsilbity to let the younger generation know,so as not to waste all thier time, that the movie business has pretty much had it..and unless you are extroarindaliry taletned and have huge drive,and know people and funds behind you,forget it and focus on the new technology areas,or jsut on the tech aspects of film such as special effects and animation?.From a peer and a fan,currently on location somewhere,making a film for humanity..
Dear Mr. Hanks; No questions ... Just a thank you! You have entertained my family and I for many years ... Good luck in any project you take on... God bless. I have been a fan of yours since bosom buddies. I truly believe you are by far the most gifted actor in Hollywood. You always seem to pick roles that make you shine, and challenge you all at the same time. I was wondering, one day when Hollywood and the world looks back on your career, what is one word you would like them to use to describe you? Also, do you have a movie that when people say Mr. Tom Hanks, you want to be known for starring in? I would use the word ILLUSTRIOUS to describe you and your career, and the movie i think you should be known for is Philadelphia. You showed the world that people living with AIDS should not be feared or left out of the life they want to live. I think that anyone living with this disease found it a little easier to handle and deal with after seeing this movie. You are by far the best of the best, you are my idol and i hope one day to meet you... What a day for me that would be! hi tom...hmmm u went to singapore lately......and like were just 3 hrs away here in PH...hope next stop is PH.........forest gump is the best inspirational movie ever!!!! Thanks much to you and Rita for your donation to Red Bluff's State Theatre! I spent so much time there as a kid – it's wonderful to see the building brought back to life. My question is: Have you ever considered producing a film in the modern western genre? Because if so, a script is waiting to be slid across the table at The Palomino Room the next time you're in town. Thank you for your wonderful work in Forrest Gump. I have seen that movie so many times. I never tire of it, there was always more between the lines. I would like to thank you for many years of exceptional entertainment, starting with Bosom Buddies and a seemingly endless C.V. of exceptional and often educating entertainment. I share with you a passion for the space program, and I am extremely excited to witness with my 14 year old son the last space shuttle launch in about 2 weeks time. I am feeding him a steady diet of "Apollo 13" and "From the Earth to the Moon." I am so glad that you have made these excellent resources. I was just wondering if you will also be able to see this historic launch? My family and I recently moved to the Sawtooth NRA and we frequently drive by your home when travelling into downtown Ketchum. What do you love about Ketchum, about Idaho, and what do you enjoy doing when in the Wood River Valley? I've enjoyed your career choice and I want to thank you! Back from the days of Bosom Buddies, I've seen just about everything you have done. Is there anything choice you've made in your life/career that you would do over again? What advice would you give to someone that aspires to be a famous actor? I can't wait to see your next movie. I am sure it will be a hit. I can't think of any movie you were in that I didn't enjoy watching. You are an inspiration to me and I hope that one day I will have the opportunity to meet with you personally. Keep making those great movies Tom!! Do you play video games? If so, which one is your favorite? What do you consider your best role? I think as Captain Miller in Saving Private Ryan you showed your best stuff. And if that was too touchy of a question, any chance of "Bosom Buddies: The Movie (The Breast of Friends)" ever being made? I hereby sign my rights over to you for the film's title. 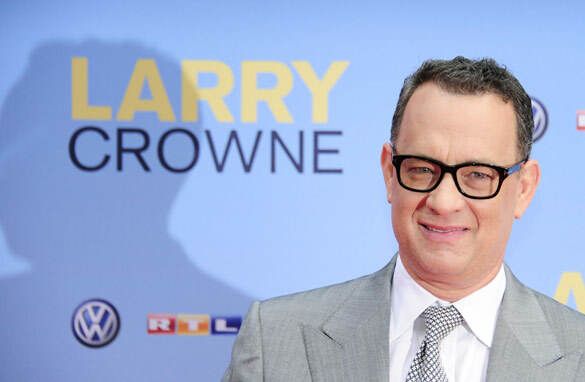 Mr. Hanks: In today's world actors seem to be hero's in much the same way as sports figures. It would appear that the ones who are on the news for all the wrong reasons are idolized the most. I wish there were more people like you and your wife in this world of ours!! It would be a much better place to live. You've made movies in Thailand and in the Mamanuca Islands. Do you ever go back to places you've worked in, just to visit as a regular tourist? Tom Hayes, Niigata, Japan. Hi Tom, What was the the movie that you had the most fun doing ? For myself i consider the money pit a classic...thank's alot for all the fun you gave us ! I'm a huge..er BIG fan of your work. Thanks for all the years of entertainment. With all of the great actors you've worked with, my favorite being Paul Newman, is there anyone whom you have not yet had the chance but would very much like to do a film? Do you think of making a movie in Turkiye. A historical movie would be a good idea. Life of the Magnificent Suleiman for ex. I just want you to know how much my family adores you and go to see your films. All memorable I must add. I am so glad to see a famous actor who is grounded in his life. You have a lovely family and spend fun time together. Also, you participate in the Greek community affairs being that your wife is of Greek heritage. I honor this. May God bless you and your family. Please do not change. I love you just the way you are. Saving private ryan and Band of Brothers were two big world war 2 successes in which you were mainly involved. Are you considering any further world war movies in the future? Your films and the glory days were my film watching days. I come from a very small island called Sri Lanka. You maybe aware of the civil war which did last for approx. 26 years and still we are under undemocratic leaders. How can you be influence the culture in this country ? I would like to take part in any roll that would help the future generation to live in peace and harmony. After all the billions you have made could put to a project by helping the needy such as " A service to humanity is the Best way of Life "
I am sure you are also going to enjoy this paradise island a tropical forest . I'm writing from Kanagawa Japan. I'm a US Army veteran, and i couldn't help but notice you seem to be a WW2 history buff. Just wondering if there was a personal reason you are so into it. You've got Band of Brothers, and the Pacific so far. Coincidentally I was actually stationed in Okinawa when the Pacific came out. Is there any chance of another mini-series with navy or air force? Tom, you and your co-actors were absolutely outstanding in, The Green Mile, which was a beautiful, and very imaginative work by Stephen King. I was very disappointed when American Beauty won all the awards in 2000. In my mind, something was wrong, at the very core of the Academy, or with the American public at large, for not appreciating the depth of what was communicated, the excellent period recreation of the movie, the outstanding acting and all of the work which went into making this film. Did you share these same feelings when this happened, that year? Hola from Madrid! I'm an American Student studying here and I was wondering.. If you were not an actor, what would you do instead? I love all of your movies and keep up the great work! If you had to pick just one film and make a t.v. sitcom out of it, which would you choose and why? Sorry forgot to say where I was writing from – Agana Heights, Guam. QUICK QUESTION: What is it that makes you good at what you do? Tom, when will you run for President of the USA? Hey Tom, I'm a huge fan of your work. Thanks for your continued support of veterans' causes. Have you ever considered doing a USO tour? Can't really decide which of your movies is my favorite! but one thing's for sure, up until today i still use the sentence "mama said life is like a box of chocolate, you never know what you'll get!' and i never thought its possible to cry so hard over a man loosing his best friend "Wilson" the ball! The list is long!!! i'm eager to watch Larry Crowne here in Beirut and see in which way it'll mark me. I've been a great fan of your films, from the hilarious Money Pit to the excellent Forest Gump and other classics like Green Mile and Road to Perdition. I'm curious what you have in the pipeline for more great films, either a return to comedy or the serious side. Hi from Japan. Tom, Forrest Gump is the best movie of all times, i can watch it 1000 times and love it every time. I want to ask you what happened to you during your career to change at some point drastically the kind of movie you star into : from young comedies to "dramatic comedies" to war movies? It was friends influence, books that you read, countries that you visited? Your movies are like pixar's animations : am anxiously waiting for the next. Thanks. I just watched Tom Hanks on the CNN morning news. I am still laughing after the amazing interview with the beautiful young woman asking him questions such as "If you could have anything you wanted, what would it be?".... he mused a moment and said something like," I would love to own CNN and I would put you in a skin tight leopard suit... " the pretty interviewer was mortified and laughing and went to a commercial break immediately. When you are ordering food at a drive thru joint, does the fast food workers ever recognize your voice through the speaker? Also, do you get telemarketing calls? If so do you ever talk to them in Woody's or Forrest's voice? You are my favorite actor and I adore your films. I am looking forward to seeing your newest performance. Hello. mr Hank, may God bless as u entertained me & my family thanks Goodluck. Dear Mr. Hanks I would like to make a movie about Victor Frankenstien's Monster (from the monsters veiwpoint). What is the best way to get a premise in front of a decision maker? Thank you. I'd like to send you a copy of my book "Before The Last All Clear'" a memoir of wartime Britain seen through the eyes of a child.